From Homeless to Billionaire – The 18 Secrets of Great Wealth and Becoming a Money Magnet will give you practical insights on tackling success and failure, how to give freely to activate positive vibrations, why passion and joy are key to successes personally and professionally and how to be a calculated risk taker and convert problems into opportunities. 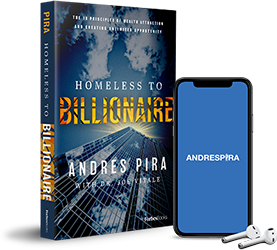 Andres spent years studying the habits, techniques, and mindset of the wealthiest people on earth and applied that to my life. If he can do it, you can too.